We've heard a lot about the tech boom in recent years, but now there are signs around Silicon Valley that it's cooling off. “The hiring itself has slowed down,” says Kris Stadelman, director of NOVA Workforce Services in Sunnyvale. But she adds that we ought to put that slowdown in perspective. “This slowdown is compared to last year, which was not a normal year for us. Last year the job market was roaring with job growth. Yes, we are seeing big layoffs, but we are still seeing hiring, too," she says. Fueling that growth were venture capitalists (VCs) and other investors plowing money into startups, on the hunt for the next Facebook or Airbnb. But that frenzy was fueling an environment where it seemed like investors were throwing money at any young guy with an idea and a hoodie. San Francisco alone has seen more than 20 startups dedicated to parking your car in the last five years, and countless more food delivery startups zigzagging across the city. Despite the fact that some of these businesses were not generating profits, nobody seemed to care. But that attitude is changing as investors have become more cautious about where they put their money. Since some disappointing initial public offerings (IPOs) last year -- like Square -- investors have realized that the public market is unwilling to match their sky-high private valuations. According to a recent survey by analytics firm PitchBook, funding dropped by 13 percent last quarter in Silicon Valley. Brosnan says investors aren’t the only ones getting pickier. Unlike in the past couple years, startup employees care less about perks like free massages and stock options and are more concerned with paychecks and salaries. "Candidates like to go work for companies that are making money because they are not dependent on the next round of funding to come in and to stay in business," he says. 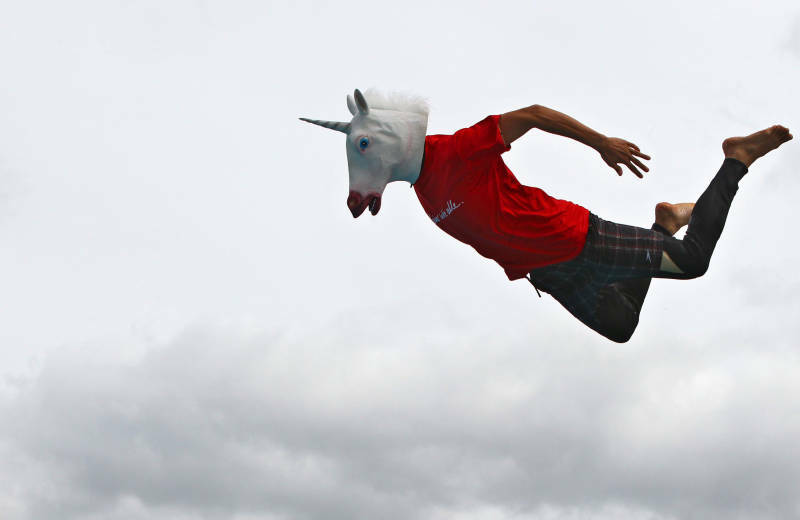 Mark Cannice, professor of entrepreneurship and innovation at the University of San Francisco, says the biggest over-valuations have been concentrated among Silicon Valley’s "unicorns," companies valued at over $1 billion. Cannice attributes over-valuations to non-traditional investors based outside Silicon Valley. That includes international firms and hedge funds from New York. “Outside investors have helped create hyper-growth in these companies, but have also driven up valuations,” Cannice says. "Valuations of the most highly valued firms have started to come down. While it's difficult for some of those companies right now, many VCs see this as a long-term opportunity,” Cannice says. Eric Buatois is a VC at Benhamou Global Ventures in Palo Alto. Like most people in Silicon Valley, Buatois doesn’t use the words “tech bubble” or “bust” when describing the recent tech economy. Instead, he describes it as "frothy." "Froth" is the Silicon Valley term for when startups are valued at much more than they’re worth. Unlike a bubble, froth doesn’t pop -- it subsides. Buatois thinks that could be a good thing for Silicon Valley. "We don’t need 30 food delivery services in Silicon Valley. 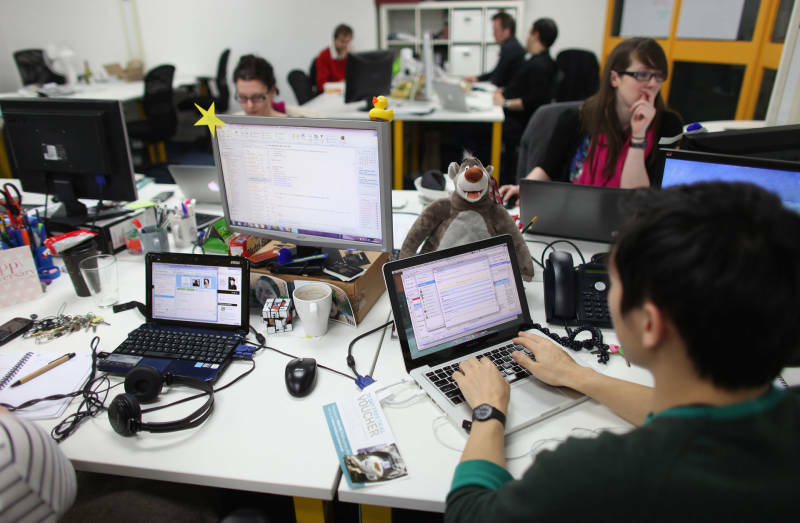 Many developers have been attracted to companies with big valuations. They are not working on the most important problems,” he says. Buatois says companies with bad business models might fall to the wayside and viable startups can sweep up talented workers to get stronger. Buatois is optimistic that, unlike the dot-com bust of 2000, he foresees a smoother landing. “In Silicon Valley, there is always this up and down," Buatois says. "It’s why this place is so creative and energetic."